July | 2012 | Dorothy Day Catholic Worker Washington, D.C.
July 28 ,2012 Oak Ridge, TN—Early this morning three plowshares activists Performed a disarmament action in response to Government plans to invest $80 billion to sustain and modernize the nuclear weapons complex. Calling themselves Transform Now Plowshares, Michael R. Walli (63), Megan Rice (82), and Greg Boertje-Obed (57) entered the Y-12 nuclear weapons facility before dawn. 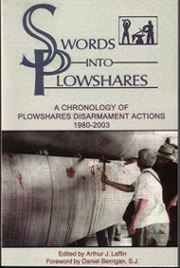 This action is one of a long tradition of Plowshares disarmament actions in the US and around the world which challenge war-making and weapons of mass destruction. At Y-12 NNSA plans to replace facilities for production and dismantlement of enriched uranium components with a new consolidated Uranium Processing Facility (UPF). It is budgeted to cost more than $6.5 billion. Visit http://transformnowplowshares.wordpress.com/ for all the latest news and updates! 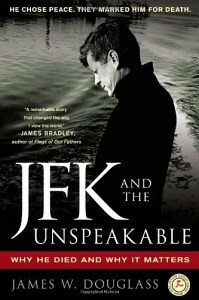 On August 6, 1945, the U.S. ushered in the Nuclear Age by using nuclear weapons against the Japanese. 67 years later, we seek to remember the pain, repent the sin and reclaim the future in a Faith and Resistance Retreat. Our retreat theme is taken from Matthew’s Gospel: ‘Why do you harbor such evil in your hearts?’ (Matthew 9:4) In our prayer and reflection together, and in our nonviolent public witness, we will seek to remove the evil in our own hearts and confront and resist the evil that has lead the U.S. to become a nuclear empire. Due to our being a smaller group this year we will only be gathering on August 5-6 and August 9 (see details below). August 5: Gather @ 6:30 p.m. at Stephen and the Incarnation Church, 1525 Newton St. NW, Washington, D.C. 20010. At 7:00 p.m. we will meet in the sanctuary for a theme reflection, action preparation, video of the aftermath of the atomic bombings and prayer. Pick-up food will be offered. August 6 (Anniversary of the U.S. nuclear bombing of Hiroshima and the feast of the Transfiguation): Nonviolent witness at the Pentagon and Udvar Hazy Museum where the Enola Gay is displayed. Times to be decided at the August 5 gathering. August 9 (Anniversary of the U.S. nuclear bombing of Nagasaki): 12 Noon – 1:00 p.m. nonviolent witness at the White House where we will be joined by two Hibakusha (A-bomb survivors) who will offer testimony. We will also remember the anniversary of the martrydom of Franz Jagerstatter and Edith Stein. We will meet at Dorothy Day Catholic Worker @ 10:00 a.m. and then go to the White House for a nonviolent witness. 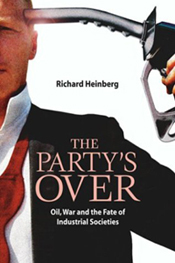 NO MORE WAR – WAR NEVER AGAIN! ABOLISH WEAPONS OF MASS DESTRUCTION FOREVER! CONVERT OUR WAR ECONOMY TO MEET HUMAN NEEDS AND PROTECT THE ENVIRONMENT! Please let us know if you can be with us. 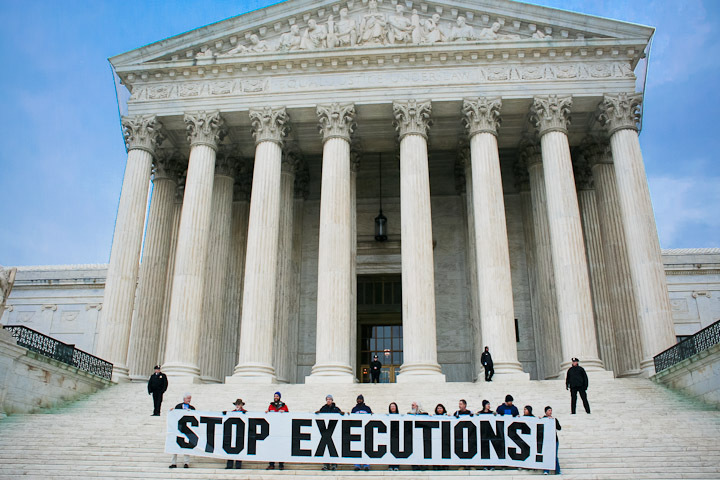 WASHINGTON, DC – June 27th, 13 death penalty abolition activists went on trial in DC Superior Court to face a charge stemming from a January 17 arrest this year at the U.S. Supreme Court. On that date, 14 protestors unfurled a 30 foot banner, which read “STOP EXECUTIONS!” on the steps of the Court. Such displays of banners are prohibited under U.S. law. After six hours of testimony, review of the evidence and presentation of oral arguments, Judge Juliet McKenna found all 13 defendants guilty and imposed a range of sentences, varying from time served and a $100 fine (plus $50 mandatory contribution to the Victims of Violent Crime Compensation Fund), up through suspended sentences of 5 to 60 days. Additionally, in various cases, 50 hours of community service was imposed, and/or 1-3 years of probation with a stay-away order from the Supreme Court grounds during probation. Four of the defendants declared in court that they would not pay any fines or participate in community service for an arrest that they believed to be unlawful and unjust. The judge then imposed a 60 day jail sentence on 80-year old DC resident Eve Tetaz, and a 5 day jail sentence on Jack Payden-Travers (a Lynchburg, Virginia resident) and Amber and Kevin Mason (both DC Catholic Workers). All 13 defendants represented themselves, with DC attorney Mark Goldstone acting as attorney advisor to the group. The “defendants spoke eloquently and passionately” stated Judge McKenna at the conclusion of the trial. “What a marvelous example of teamwork.” The judge then commended defendant Randy Gardner for “channeling your experiences…in productive ways giving back to the community.” Gardner, whose brother was executed by a Utah firing squad in June 2010 said on the stand, “I can’t imagine teaching [my son] that it is okay to kill someone for killing someone else.” Gardner’s 14-year old son sat in the courtroom watching as his dad took the stand as one of the three defense witnesses. At the time of the January arrest, five of the defendants did not carry any identification, and when asked for their names by the police, each responded, “I am Troy Davis.” Troy Davis was executed last September in Georgia under serious doubt about his guilt. Although this act of solidarity did not result in any increased penalties at trial for the involved defendants, Troy Davis’s name and memory were brought into the courtroom. The January 17 protest that resulted in the arrest of 14 activists took place on the 35th anniversary of the execution of Gary Gilmore, the first execution under contemporary laws. The protestors included Amber Mason, Kevin Mason, Eve Tetaz, Daniel Flynn, Anne Feczko, Scott Langley, Jack Payden-Travers, Ron Kaz, Anna Shockley, Randy Gardner, Charity Lee, Rachel Lawler, Jon Dunn and Tom Muther.